The Iron Eagles Cinderella season finally ended this morning. Iron Eagles "Optimus" demonstrated some excellent skill today, helping their alliance advance through the Edison Division semifinals (2-1) before falling 0-2 in the division finals at the FIRST Robotics World Championship in St. Louis. As a division finalist, they ended their season as a member of one of the top four alliances (12 total teams) in the world! Thanks to these dedicated students and their mentors for working so hard to achieve this major milestone for our program. 1) Vandegrift Qualifier - Iron Eagles "Optimus" and "Prime" join forces to win the first qualifier of the season. 2) Connally Double Qualifier - Both Optimus and Prime make their division semifinals, and Optimus earns 2nd place for the Inspire Award. 3) Alamo Regional - Prime is a member of the tournament winning alliance, and Optimus makes the division semifinals and wins the PTC Design Award. Both teams advance to the Super-Regionals. 4) South Super-Regional - Optimus is the #1 ranked team in the Bluford Division, and both teams advance to the tournament semi-finals and earn a trip to the World Championship. Only 10 Texas teams advance to the World Championship, and little St. Dominic Savio Catholic High School becomes the ONLY school in the state of Texas to have TWO teams advance! 5) World Championship - Optimus advances to the Edison Division finals, and Prime goes undefeated on the second day of competition. Optimus ends the season as the top-ranked team from the state of Texas! We're so proud of the students in our Iron Eagles Robotics program and hope that they are having a great time in St. Louis! Safe travels home! Iron Eagles to play in the Elimination Rounds! After two days of very tough matches, Optimus finished the tournament ranked #17 in the Edison division with a 6-3 record. Of the six teams from Austin advancing to the World Championship, Optimus was the highest ranked in either division after the qualifying rounds. As always, Optimus was noted for their consistency and excellent programming, as well as their many high scores, and they were thrilled to accept an invitation to join the #3 alliance in the Edison division along with Team 6433 (Neutrinos from Lakeland, FL) and Team 6424 (Oly Cow from Olympia, WA). In addition, after a very tough first day, we were so proud of our second team, Iron Eagles Prime, as they stormed back and went undefeated on the second day, winning their last 3 matches to finish the tournament ranked #48 in their division with a 3-6 record. And although they didn't get picked to compete in the Elimination Rounds, their contribution to the success of the entire program should not be underestimated. To start, in their second match of the day, our two teams joined forces to compete together as "Optimus Prime." In that match, our opponent tried the strategy of blocking our "better" robot (Optimus) so that their best robot could easily go head to head against low-ranked Prime. Bad move. Prime dominated the rest of the game and led the Iron Eagles to a 279-87 victory, even after their opponent's aggressive blocking tactics had caused an electrical failure that shut Optimus down for the last 30 seconds or so of the match. Then, in their next match, Prime's opponents tried the exact same strategy, attempting to take on Prime with their best robot - same result, as Prime led their alliance to a 270-238 victory. And finally, in the last match of the day, Prime's alliance faced two top 12 teams - and won in convincing fashion, 384-238. This victory actually pushed their alliance partner into the #1 rank in their division! These very significant victories definitely helped promote the "Iron Eagles" brand all over the stadium, as the other teams simply could not ignore the enthusiasm and skill displayed by our two teams. In fact, when the "Optimus Prime" alliance was announced on the field, it received the loudest response heard all day! All of this contributed to Optimus being recognized and chosen to compete in the Elimination Rounds. We are so proud and grateful to all of our students and their fantastic display of team unity and Gracious Professionalism! 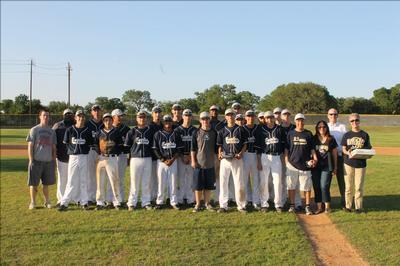 Savio baseball celebrated Senior Night with a combined no hitter Tuesday night. 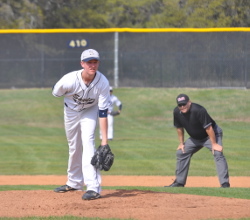 Dominic Kress pitched 6 2/3's innings allowing zero hits and striking out 12 San Antonio Christian batters. Mr. Kress gladly handed the ball off to senior Nick Zamora to record the final out of the game. Daniel Zamora (Freshman) came in to catch his older brother for the final out of the game. Savio honored seniors, Nick Zamora and Frank Nichols for a very special senior night. Freshmen catcher, John Digravio, drove in 3 runs on a bases loaded triple in the 3rd which was followed by an inside the park home-run by Simon Scales, to give Savio the early 5-0 lead. Savio would drive in 3 more runs to secure the win and improve to 21-7 on the season. CCIW would win their game, which gives Savio the advance to the playoffs due to a 3 way tie. Savio will travel to Houston Second Baptist for the first round of the playoffs. Time and date is still TBA so check back for further details. 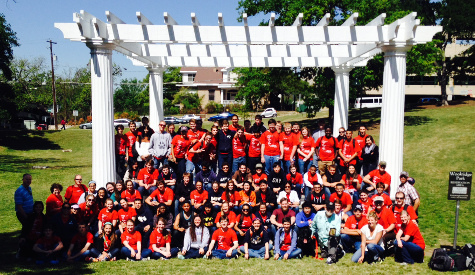 Congratulations to all band, orchestra, and choir members for their success at the Director's Choice Six Flags competitions. 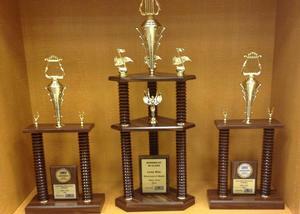 Choir received outstanding and runner up in class, trophy for both. Symphony Orchestra received excellent and a trophy. The St Dominic Savio Home and School Association and Booster Club would like to congratulate their new 2014-2015 officers. Thank you to these outstanding men and women for volunteering their time and for their commitment to our school. There will be a Volunteer Appreciation Mass on May 14 at 2:30 honoring our past officers, new officers and all the dedicated volunteers who have helped out throughout the year. We hope to see you there. The Savio Girls Golf team participated in the TAPPS 4A regional golf tournament at Meadowbrook Farms Golf Club in Katy on Monday, April 14. The field consisted of the top eight teams from the South districts. The day started calmly with temperatures in the low 70’s and a light breeze. The weather took a drastic turn midway through the tournament with the winds increasing to 25-30 mph and the temperature dropping into the low 50’s with a light rain. The girls played through the weather until a two-hour rain delay. Play resumed with no rain but temperatures in the lower 40’s with wind chills in the upper 30’s. The team was led by top 10 regional medalists Junior Brooke Ellis, Sophomores Savanah Acosta, Shelbie Sagnes, Layne Smith and Freshman Connor Neill. 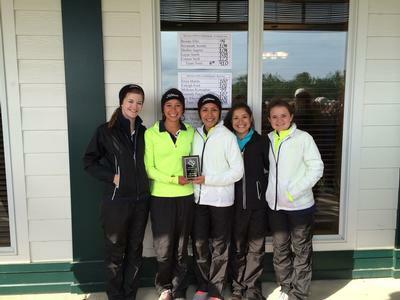 The girls will compete at the State tournament on April 28 & 29 at Twin Rivers Country Club in Waco. Savio Track Team District Recognitions and Region Bound! TAPPS District Track Meet on April 11 & 12, SAC San Antonio, TX. Despite fielding only 6 athletes, the Savio Ladies Track Team earned an astounding 83 points, taking 3rd Place overall and topping the fourth place finishers by over twenty points. Every one of those ladies won points for the team in both their individual races and on relays. The Regional track meet is on April 25 & 26 Awty International in Houston. Fans are certainly appreciated! Nearly half of our men's and women's teams, combined, are continuing to Regionals. Lets keep team spirit high and support all our athletes who are continuing on to regional competition! The St. Dominic Savio Athletic Department would like to invite you to the Athletics Awards Night on Friday, May 2nd, at 6pm in the Savio gym. Please join us as we celebrate the accomplishments of our Eagle athletes this year. We've got a lot to celebrate as many of our teams have had amazing seasons and we still have several teams prepping to make State appearances in the next couple of weeks. We do realize that we may be missing some athletes as our track team is making a run for the State meet which will take place on May 2nd-3rd, so let's continue to send positive energy their way. We hope to see you there! The 12th Annual Diocese of Austin Science Fair was hosted at St. Dominic Savio Catholic High School on Saturday, April 5. There were 124 students (6th – 8th grade) with 86 projects representing nine of our Catholic elementary schools. The award-winning Savio Robotics teams coordinated the sale of food/beverages during the event in order to raise funds for their upcoming competition at World Championship in St. Louis, Missouri. In addition, the Robotics teams provided an exciting demonstration of the robots and opportunities for the middle school students to 'drive' the robots! This past April 9-10, the Junior class of St. Dominic Savio Catholic High School spent the 20 hours of their annual class retreat learning from the homeless community of downtown Austin. Led by adults from the school, youth ministers from parishes all over the city, several deacons, a priest, associates from Mobile Loaves and Fishes (a local advocacy group), and a number of parent volunteers, these students hiked around downtown Austin carrying with them only a few basic necessities. They spent their time eating and talking with our brothers and sisters on the street, in addition to gathering together for prayer, Eucharistic Exposition and Adoration, and Mass. They were hosted by a multitude of churches and organizations including St. Mary's Cathedral, St. Austin's Catholic Church, Mobile Loaves and Fishes, and Feed My People. "My favorite part of the retreat was listening to the stories of those who were homeless. They were actually able to teach me some things, like don't ever give up. What made an impression on me the most was those people's faith. The people who had the most reason to be mad at God were the people that relied on Him the most. It was very touching to me." "At breakfast, I was eating with some other retreat members, when a homeless men came to our table and ate with us. It was a very good experience, and they talked about how they arrived there. One of them was a man making $50,000 a year, but lost it. Another was making good money, but had his car break down twice and then had to leave. It was surprising to me how something so little can change someone's life so greatly. What struck me was that throughout all of this, they believed in God." "During the retreat, interacting with those I met made me feel that the homeliness community is very diverse, despite popular belief, and with that comes the fact that all those people on the street are individuals, and have their own story to tell. " "I loved being able to talk to the people. At first I was nervous, but when we got to the Salvation Army area I was amazed how easy they were to talk to. I was struck by how easy it was to connect with them and by how welcoming they were." "The whole retreat I felt a sense of peace. When I first started talking to them I enjoyed the feeling of connecting to them as people. It was so easy to see them as human beings, I had never realized I objectified them before." "Because of this retreat, I feel a stronger call to serve others as Christ wants me to. I feel less afraid of service and less of a stereotype against homeless people. I think going forward from this retreat I will be able to serve others as my brothers and sisters in Christ and treat them with the dignity that they deserve." "I felt as if I was helping them, but not necessarily in a physical way. I think that just listening to them tell their stories and share their life with us was us helping them. Many of those people do not get to share their stories with people that often, and this retreat was a chance for them to do just that." Get Your Soiree Tickets Now! The big night is fast approaching! Grab your friends and join the fun at An Evening at the Oasis, Savio Soiree 2014. Live music, Casino games, Live and Silent Auction, Raffle, Dinner and Dancing await you at the beautiful Oasis on Lake Travis. Tickets available HERE. 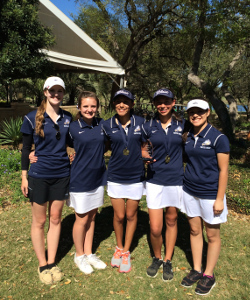 The Savio Boys and Girls Golf teams participated in the 4A district tournament at Grey Rock Golf Club on April 8. The sky was clear, the temperature started in the 40’s and eventually reached the upper 60’s but the wind gusted between 15-20 mph throughout the day adding an additional variable to the already challenging course. The Boys team was led by Sophomore Captain Clayton Knavel along with Sophomore Shane Hoelting, Juniors Gannon Nash & Bradley Musabika. The Girls team fought hard the entire day and capped off the District Tournament by placing 3rd and qualifying for the 4A regional tournament next week at Meadowbrook Farms Golf Club in Katy. The team recorded one of their best scores all season with Junior Co-Captain Brooke Ellis medaling in 4th place and Sophomore Co-Captain Savanah Acosta medaling in 6th place along with great showings from Sophomores Shelbie Sagnes, Layne Smith & Freshman Connor Neill. Congratulations to the Men on a fine season and good luck to the Lady Eagles at Regionals. Freshman Emily Shoemaker and junior Grace Isakson are the first two Savio students to be crowned state champions in TAPPS academic events. At the state competition in Waco on April 8th Emily won first place in Number Sense, and Grace won first place in both TAPPS Math and the Science event. Additionally, Grace was recognized for having the top score in the Physics portion of the Science event. But these two young ladies were not alone. 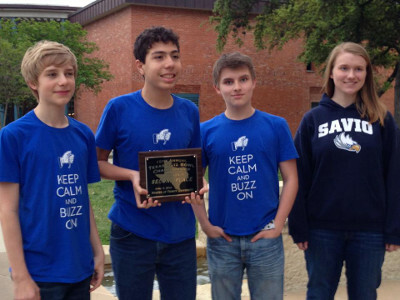 A total of seven Savio students advanced to the state competition. Collectively Savio had 14 entries at state, scoring a total of 55 points and taking 4th place overall, out of 25 schools. Each of the other schools in the top six had at least 25 entries, so the Savio group was a very productive one indeed. Savio Baseball Gets 20th Win! 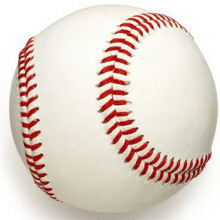 The baseball team improved to 20-5 on the season with a 13-1 victory over San Marcos Academy. They are currently 4-2 in district play. 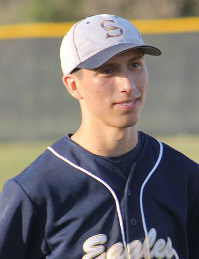 Dominic Kress started on the hill for Savio and pitched 3 strong innings and improved to 4-0 on the season. Marty Sedlacek swiped 4 bases and drove in a run and Jacob Kilburn drove in 2 more runs on 2 hits. 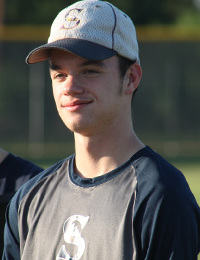 Savio swiped a total of 10 bases in their rout of San Marcos Academy. Savio will square off in San Antonio Saturday against TMI in a pivotal district game at 3pm. If you can make the trip, Savio baseball needs to hear your cheers! Tuesday April 15th, Savio will host Regents at 4:30pm. 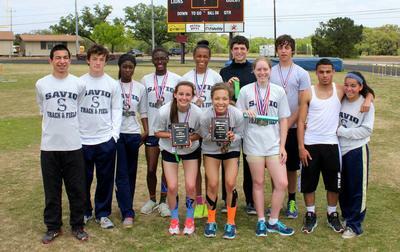 Savio Track Team Medals at Recent Meets and Makes Exciting Improvements On and Off the Big Stage! 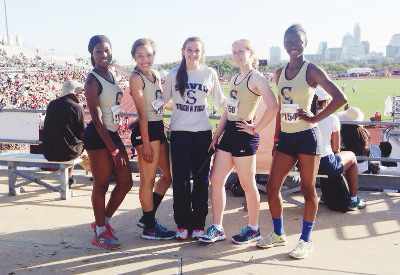 The Savio Eagle's Track Team did a great job at the BVU meet in Dallas, TX! The girls 4x200M relay team won their heat and ran a very fast time of 1:48.53, which was a big improvement from their last race. They were in place to win the event by a long way, but they were (controversially) disqualified for stepping out the zone. They also improved the 4x400M relay's time, from 4:34.23 to 4:23.00, and finished in 3rd place. Alana McKendall and Alexis Phillips finished 6th & 7th place overall in the 100M dash. Alana McKendall finished 3rd overall in the 200M. Sam Alvarado ran a PR in the 800M at 2:23.11, and Julian Sparks had a PR again in the 800M with a time of 2:12.23 (last week he ran 2:15). Stephen Hampton, a freshman, did an awesome job as a freshman in the 100M. He finished 2nd in his heat and 4th in his heat in the 400M. Ana Richie and Jennifer Ezuruike were top ten finishers in the 400M. Melanie Shempert did a great job in the 200M and 400M dash and Cristian Cowley threw his PR over 80 feet. There was excitement and drama for the day. It was a small, but mighty, Savio delegation on warm, sunny Friday afternoon for the amazing Texas Relays! After sharing a healthy team luncheon, the 4x400m relay team Alexis Phillips, Angele Kelly, Ana Richie, Jennifer Ezuruike, Stephanie Moses and their dedicated fans navigated the crowds, lines, parking garages, bag searches, on their way into the BIG EVENT. A thunder storm rolled in as Alexis, the first leg, took her mark. The stadium was evacuated before they could run their heat. When it was safe to return, our Lady Eagle team returned to the track as we made our way back to high ground. Once more, Alexis took her place in Lane 3 and we all felt a great anticipation. This is where the 8 seconds got lost!! As unbelievable as it may seem, each of our ladies just left it behind right there on the track. They are all to be held responsible. In fact, in just her one turn around the track, Jennifer lost 4 seconds of it herself!! Finishing strong and right in the mix of other runners in their heat, our ladies abandoned 8 seconds that they came in with. Just amazing! Our Team stepped up and burned the track. Here are the highlights for this post Texas Relay meet the next day: Alana McKendall 2nd 100m and 200m, Ana Richie 1st in 400m, Angle Kelly 1st in triple jump, Sean Casey 1st in discus. Medals, Medals! State meet here we come! Stephanie Moses took home 1st place in 200m, Angele Kelly 4th in 200m, Sam Alvarado 6th in 400m, in 400m Ana Richie took 1st with Angele Kelly 2nd! Andrea Alvarado placed 9th, Julian Sparks took home 2nd in 800m and 6th in the 1600m, Melanie Shempert 3rd in 300m hurdles, Sean Casey 6th in shot put, 2nd in Discus, Angele Kelly placed 3rd in Triple Jump. Many individual improvements and new events were taken on by our young team! Up and coming performers continue to show great improvement: Alexis DeMeo, Andrea Alvarado, Melanie Shempert, Steven Hampton & Matthew Bianchi! NHS Fun Run Results are In! This year the Savio Chapter of the National Honor Society held its first annual fundraiser to benefit the Heifer Project. The Heifer Project provides farm animals to villages around the world to be used for nutrition and economic income. The students' goal was to raise $5000 to purchase "The Ark" which will buy two of each animal the organization provides. 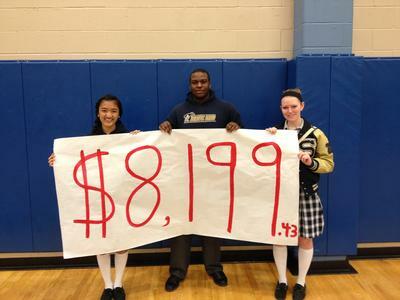 On March 22 the students hosted a Fun Run and raised a grand total of $8199.43!!! 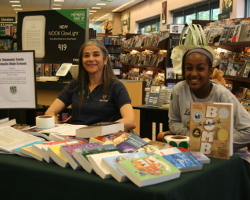 On Saturday, April 5th, St. Dominic Savio Catholic High School held its 5th annual bookfair at the Barnes & Noble Bookstore near Lakeline. 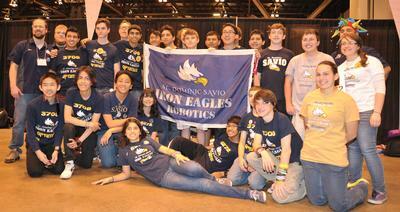 This fun event featured Savio's award winning Robotics Team and Music Department. 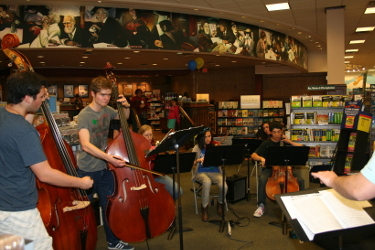 The bookfair continues online through Thursday, April 10th at bn.com/bookfairs. A percentage of your Barnes & Noble purchases will benefit the St. Dominic Savio Catholic High School Library. Submit our “Bookfair ID #11296001” at checkout. Thanks for supporting our Savio Library! 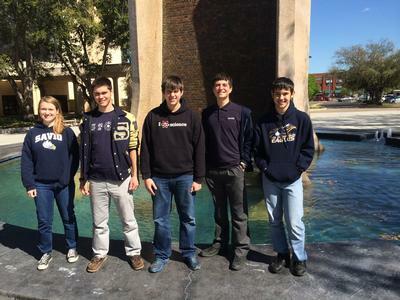 On Saturday April 5th Eleazar Camez, Grace Isakson, Daniel Jilek and Patrick Lahey competed in the Texas State Quiz Bowl Division II Championship tournament at Trinity University in San Antonio. The Eagles were sharp right from the start, blowing out Shepton High School 325-100 in their first match. Match number two was a bit of a painful, low-scoring affair, but the Eagles managed to triumph over North Hills Prep 195-95. In match three Savio beat San Antonio Champion High School 420-100 and blew out Temple High School 450-35 in their fourth match. The fifth match of the day pitted the Eagles against a familiar foe, San Antonio Brandeis. Savio had easily whipped Brandeis in two tournaments early in the year. But more recently Brandeis had beaten Savio in the History Bowl and the Bluebonnet Bowl. The Eagles got their revenge, handing Brandeis their first loss of the day 360-220. As the only unbeaten team at this point in the day the Eagles were feeling good, comfortably sitting in the #1 position in group B. In the afternoon session the Eagles played matches against the top three teams from group A. In the first of the three matches they completely demolished the team from Carnegie Vanguard by a score of 400-115. In the next match they met up with Katy Taylor High School, who was the experts' pick to win the tournament. They proved worthy of their reputation as they put the Eagles on their heels early. But undisciplined play cost the Taylor team dearly. They committed a total of six NEG5's in the match including four in a row on tossups 3 thru 6. This allowed the Eagles to overcome an early lead by Taylor and surge ahead 80-30 heading into tossup #8. But Taylor fought back, and at the half Savio held a slim 115-95 lead. Taylor rallied back and took a 175-115 lead heading into tossup #14. Taylor's next two NEG5's enabled Savio to pull into a 165-165 tie heading into tossup #16. Going into the final toss-up Taylor led 185-165. On the last tossup Patrick Lahey recognized Yulia Tymoshenko as the prime minister of Ukraine and buzzed to claim 10 points plus a bonus opportunity. The team correctly answered "Bitcoin" on the first part of the bonus as the digital currency recently criticized in the news. The Eagles missed the second part of the bonus, but Patrick came thru on the last part, answering that "Ponzi scheme" was the term being applied to Bitcoin by its critics. Final score Savio 195, Taylor 185. This was Taylor's third loss of the day, which ended their chance to make the finals. The Eagle's were 7-0 at this point but were yet to meet the #1 team from group A. They faced that team, St. Thomas Catholic, in the 8th match of the day. It was a tough one for the Eagles as they struggled to match the buzzer speed of the St. Thomas team. In the end the Eagles were handed their first loss by a score of 245-215. However, as the only team with just one loss the Eagles advanced to the championship round! Two teams each had two losses, St. Thomas and Carnegie Vanguard. These two teams played a tie-breaker match, which was won by Carnegie, putting them into the final series with the Eagles. The Carnegie team bore no resemblence to the team that Savio had beaten easily in the first match after lunch. They were the same kids, but the quality of their play was significantly higher. They put up a very strong fight and in the end prevailed over the Eagles in two straight games, 245-165 and 300-210. Despite their disappointment at not claiming the first place plaque, the Eagles players and all friends and family present were extremely proud of their performance for the day. Second place in the Division II State Tournament is a huge accomplishment for our young program. Daniel Jilek was once again the top scorer for the Eagles with 44 points per game (11 powers and 4 NEG5's). But Patrick Lahey was right there with him with 41.5 points per game (12 powers and 1 NEG5). Eleazar Camez and Grace Isakson won some accolades as well. Before the tournament started students were given the opportunity to take some written subject tests. Eleazar got the third highest score on the Humanities test, and Grace got the third highest score on the Science and Math test. 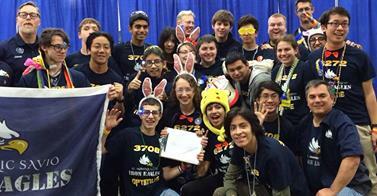 The team's focus will now shift to the National Academic Championship in Chicago on the first weekend in June. But it will not be just these four players making the trip. George Hinkel, Nicholas Isakson, and Calvin Nazareth will make up the roster for a second squad of Eagles competing in this event. In the remaining weeks before the tournament they will re-train themselves to play a slightly different style of game which is used at this event. On February 27-28, both Iron Eagles robotics teams went to San Antonio to participate in the inaugural FIRST Tech Challenge Southern Super-Regional Championships. This event brought the 72 best FTC robotics teams from 12 southern states to compete for a spot in the FIRST World Championship. Iron Eagles “Optimus” went undefeated (6-0) in the Bluford division to enter the finals as the #1 ranked team. In the Ochoa division, after a rough first day that saw them lose two matches by just 10 points, Iron Eagles “Prime” came back strong on the second day to win their final two matches and finish 3-3. While ranked only 19th in their division, their game performance made a big impression on other teams, and Prime was selected by the 3rd ranked team to join their alliance for the elimination rounds. Both teams played well, but their alliances lost in the division semifinals. But by making it to the elimination rounds, both Iron Eagles teams qualified to advance to the World Championship in April! This is an extraordinary achievement, as only 10 teams from Texas advanced, and St. Dominic Savio is the ONLY school in Texas to send two teams to the World Championship. In addition, the amazing strength of the Central Texas region was demonstrated at the tournament, as six teams from Austin advanced to the World Championship – equaling the number of teams advancing from the entire state of Florida! The Iron Eagles are now turning their sights towards raising the funds needed to travel to the World Championship in St. Louis for the third time! Last year, Iron Eagles “Prime” finished 7th in their division at the World Championship, and both teams look forward to improving on that performance. "Savio baseball suffered their first district loss at the hands of Hyde Park 3-0. Savio couldn't get much going against Chance Kirby for the Panthers who struck out 14 Savio hitters. It was probably the best pitcher Savio has seen all season. Schyler Hallberg (4-1) pitched a complete game for Savio striking out 8 Hyde Park hitters and allowing just one earned run. The other 2 runs advanced on errors."